Victim: Male. Mid-thirties. 5'7". Cause of death: Hanging. Initial impression - murder. ID: Mickey Doyle. Suspected terrorist and member of the Mayday Five. The officers at the crime scene know exactly who the victim is. Doyle was one of five suspected bombers who caused the deaths of sixteen people. The remaining four are also missing and when a second body is found, decapitated, it's clear they are being killed by the same methods their victims suffered. Forensic psychologist Paula Maguire is assigned the case but she is up against the clock - both personally and professionally. With moral boundaries blurred between victim and perpetrator, will be Paula be able to find those responsible? After all, even killers deserve justice, don't they? Claire McGowan is one of a new generation of British & Irish crime writers who in the past few years have quickly ascended from fresh voices breaking in to established must-read status (for me, at least, and I suggest should be for you too - Eva Dolan is another on the same list). McGowan writes intelligent crime fiction that ticks boxes across the board: good crime plotlines, interesting and well-drawn characters, plenty of depth to go with page-turning pace, a great and rich sense of setting, and plenty of underlying issues among the people and places she sets her tales. But there's also much more here than just ticking all boxes on what can make for a good or great crime novel; McGowan has that magic touch for balancing various aspects, and putting enough of a fresh spin on things to make the sum even greater than all its very good component parts. There's plenty of marrow in the well-constructed bones. 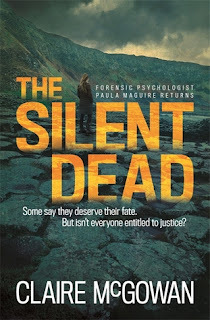 I first encountered McGowan's series heroine, forensic psychologist Paula Maguire, in a terrific short novella published in between series novels. That looked back to a teenage Maguire and gave an insight into some things that set her on the path to fighting crime and finding justice (or trying to). McGowan loses none of the verve and power of that story in a full-length novel, while adding further depth and layers. 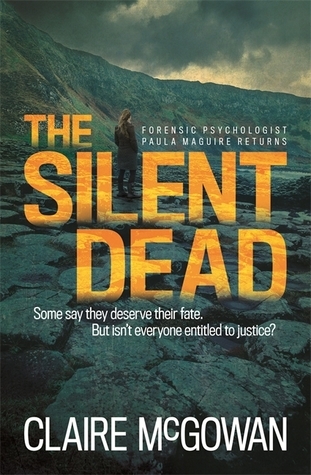 THE SILENT DEAD is an excellent read, a compulsive page-turner that draws you in early and keeps you riveted throughout, while offering lots of thought-provoking depth and rich characterisation to go along with the intriguing 'who's behind all of this, and why?' storylines. Maguire is heavily pregnant in THE SILENT DEAD, unsure which of her two past lovers is the father. It's a complicated situation on several fronts, especially given their identities - a man who's a been a big part of Maguire's history, and a man who plays a key part in her professional present. Add in a complicated case: the abduction and killing of suspects in an horrific bombing that sought to reignite 'the Troubles' - is it vigilantes seeking overdue justice, paramilitaries cleaning house of bad PR, or something else going on? - and Maguire's life is teetering on the edge in several ways. Determined to show that she's still highly capable, and valuable to the investigation, despite her 'condition', Maguire barnstorms her way around. There's a lot to admire about the character, who isn't without her flaws, but comes across as very human and engaging. There are understandable reasons for her choices and actions, even if readers might wish she'd made different ones at times. In this way, and others, McGowan does a great job drawing us in and bringing us alongside Maguire and her colleagues as they investigate a case that tears them in all sorts of directions. THE SILENT DEAD will intrigue your head and tug at your heart. A very fine crime novel.